Union issues fire cuts warning RADICAL cuts to South Yorkshire Fire and Rescue Service are being planned which would slash numbers of firefighters and could eventually leave some communities with only ‘on call’ crews available from local stations at night. The proposals – which go before politicians on Monday – have been described as ‘devastating for the safety of firefighters and the public’ by the Fire Brigades Union. 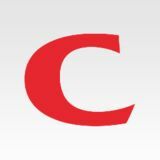 n Full report – see page 8.
n The Barnsley Chronicle is relaunching its popular Baby of the Year competition this week after almost five years. So if you know a little cutie you think could take the title, make sure you see Friday’s paper to find out how to enter. Busy pupils learn value of recycling CHILDREN at a local primary school have shown a lot of bottle in their latest project aimed at learning more about recycling. Over the last few months, pupils at Jump Primary School have worked with Barnsley’s Tidy Team, members of the Inner Wheel, the public and their parents to collect plastic bottles. And they have now created a greenhouse, which will be used as part of the school environmental council’s plans to educate pupils on conservation and recycling. The programme has also included pupils undertaking litter picks in the village. Health initiative BARNSLEY Council is working with its neighbours on a scheme to promote sport and healthy activities in communities across the Dearne Valley after winning cash backing from Sport England. Along with councils in Doncaster and Rotherham, it has been planning the Active Dearne initiative for more than two years, after deciding that a collaborative approach was the best way forward. Dad Dave is the business... A BARNSLEY-BORN photographer has been named ‘Business Dad of the Year’ at the Family Network Business Recognition Awards in London. Dave Fawbert, who owns and runs David Fawbert Photography, took the prize at the gala event. Dave was born and grew up in Barnsley, attending Wilthorpe School, Darton High School and Barnsley College. He went to The University of Warwick to study physics, and later settled in Warwick and worked in Birmingham. The award coincides with the first anniversary of Dave’s business. Though he has been photographing for many years, he only took the plunge to leave the corporate world behind and become a full-time freelance photographer in March 2018. Dave, who now lives in Warwick, said: “Winning the award coincides with my business’s first anniversary. “It makes me especially proud to win, not just for business success – but for combining this with being a husband and a father of two children. It’s not always easy, and I work harder than I’ve ever done before, but it’s worth it.” Dave specialises in theatre, dance and performance photography, working for theatre companies and dance schools as well as commercial clients across the UK. He frequently returns to Barnsley, where his mum and sister still live. The Family Network, formerly known as Networking Mummies, has been instrumental to Dave’s success over the last year. n WINNER: Dave Fawbert is ‘Business Dad of the Year’ n A BARNSLEY man has donated £500 to help with the care of diabetes patients in memory of his beloved wife who died earlier this year. Fred Land raised the funds in lieu of flowers at the funeral of his wife, Doreen, which he and his son, Gary, then topped up to make £300. Holgate Lodge Freemasons, where Fred and Doreen were members, then added another £200. Fred, 83, of Day Street, said: ““My wife Doreen wasn’t diabetic but she would have approved of us making this donation.” The donation will benefit the Diabetes Centre at Barnsley Hospital. Hospital hit by power outage BARNSLEY Hospital had to operate on their essential generator after suffering a power cut last Monday. The power went off at around 10.30am and was restored by 4.50pm. A spokesperson from Barnsley Hospital said: “As a result of a substation failure on site, we experienced an interruption to power to the hospital on Monday. “Our essential power supply to wards and theatres worked as expected and impact on patients was minimal. I was impressed yet again by the dedication of our staff and by how well everyone pulled together to resolve the disruption swiftly. Have a cracking time on the farm CANNON Hall Farm will host an interactive Easter egg hunt for children. Families will have to help the Easter Bunny to find all his Easter eggs after his egg machine exploded and threw eggs across the farm. Children will complete challenges to collect cogs to fix the machines to help save Easter. Children will also be able to have a photo taken with the Easter Bunny once the Easter egg hunt has finished. The event runs from April 13 to April 22 and tickets are available on the Cannon Hall Farm website or on the gate. n EXCITING NEW CHAPTER: The new library as it will look when work is completed and (above) work in progress. apy. Through the therapeutic and psychological benefits of a 12-step make-up programme, the workshops help women combat the visible side-effects of cancer treatment. The first of six two-hour workshops launched on March 11 in a team room at Asda, Barnsley. n The next workshop is on Monday, May 13 at Asda and there is a waiting list. Richard Metcalfe, Macmillan programme lead, said: “Anxiety can have a devastating effect on people living with and after a cancer diagnosis, but participants who have attended a course told us they now feel equipped with the tools to help when their anxiety becomes overwhelming. They also say they feel happier, more empowered and less alone. “The service, provided by the Well, will now also use their expertise to work with the local NHS services, which provide psychological support, to make sure what they have found is shared more widely to reach more people affected by cancer.” Following the success of the pilot sessions, Cheryl will continue to run the anxiety groups. A trained consultant can visit you at a convenient time IN YOUR HOME to offer advice and take your instructions. So please call us now for your FREE information pack. The Nationwide Experts for Wills, Funeral Plans, Power of Attorney, Living Wills, Property Trusts and Document Storage. RRP £14.99 OFFER PRICE £10.39 The ‘eleventh hour of the eleventh day of the eleventh month’ of 1918 was supposed to be the conclusion of the ‘war to end all wars’. Just twenty-one years after the armistice was signed, Barnsley, its borough and the world braced itself for a global conflict that history would eventually testify to be deadlier than the war that destroyed a generation of Barnsley men and boys. The books narrative explains in detail Barnsley’s transition from its interwar years, to the euphoria of victory in 1945, supported by a timeline of national events that helped shape the town. Indeed, Barnsley rose to the challenge as it did years earlier, women once again revealed their rightful place in society as equals, miners smashed productivity records, men and women took up arms in anticipation of invasion. The Second World War had arguably the same impacts on Barnsley as the Great War, further local names etched on the memorials as a timeless reminder of the men, women and children who died or gave their life for their town, county and country. Never to be forgotten. This entitles the bearer to receive Barnsley at War 1939-45 at the discounted price of £10.39 in the Barnsley Chronicle Bookshop only. Offer vaild from 1st April – 30th April 2019 Visit us in store or online for more savings on top-selling fiction and non-fiction titles. 1819 and died in 1885. Professor Chase, professor of social history at the University of Leeds, will be giving the illustrated talk about the history of Chartism and Burland’s links to the movement. The talk will also celebrate the end of a project to transcribe Burland’s Annals of Barnsley – which covers the borough’s history – that was recently completed by The Friends of Barnsley Archives. Blazes are tackled THE seventh fire this year at a derelict care home saw firefighters again called to the site. The former Belmont care home on Lamb Lane in Monk Bretton is set to be demolished after becoming a priority for local councillors following repeated arson attacks by suspected gangs of youths, with the council stating a preference to knock the building down. On Tuesday at 2am firefighters from Cudworth and Barnsley stations spent more than an hour dealing with the fire, which has again been listed as deliberate. n Meanwhile, firefighters were called to a street in Bolton-upon-Dearne to put out a car fire. A spokesman for South Yorkshire Fire and Rescue said the Ford Fiesta, found on Carr Head Lane, was deliberately set alight at 12.30am last Sunday. Three arrests after police cars torched THREE men have been arrested after two police cars were deliberately set alight. At 2am yesterday morning, fire fighters were called to Goldthorpe Police station on Barnsley Road following reports that two cars were alight. Three men, aged 35, 18 and 33, were arrested shortly after on suspicion of causing criminal damage and arson. Chief Inspector Mark James said: “This reckless incident has left two operational police cars extensively damaged and behaviour like this will not be tolerated. more than 18 per cent of adults still smoking – even though that figure is substantially down on the town’s historic record, it is markedly above the national average of around 15 per cent. Smoking is more common among poorer residents and figures show almost a third of Barnsley households living in poverty have a smoker present. If smokers in those households were to quit, 2,140 families would see their lifestyles rise above the poverty line, funded by the cash not going to buy tobacco. Successful schemes in Barnsley have included making play areas in parks and some of the town centre voluntary ‘smoke free areas’, an idea which is now being expanded to the areas around school gates. The policy is to make smoking invisible to children, so it no longer appears normal to them to adopt the habit as they grow up. Are you living with atopic dermatitis? Popular club night returns A CLUB event that ran every Friday until 2011 is returning to Barnsley for a reunion. ‘Burn Down the Disco’ ran every Friday from 2005 and featured sets from DJs and hosted Barnsley’s first Silent Disco. The event will return to Barnsley and will feature some bands that used to play at the original event. n ‘Burn Down the Disco Reunion’ will take place at The Garrison on Friday from 8pm. n CLOCKING ON: Alichia Kwapisz wants to apply some TLC to the famous clock on Eldon Street. the council over the past 18 order in the store.” months, but to no avail, hence n To donate to help with the this is our last shot, I think. restoration of the clock see the “As a thank you to anyone who Just Giving page set up by Alichia, donates, I will also give a onewhich can be found by visiting the off ten per cent discount off any Prisco’s Facebook page. way of some waymarked walking routes, a project prioritised by ward councillors. “While we have had no confirmed cases of developers putting up netting on hedges and trees and damaging wildlife in our borough, it is being recommended that development sites do not use these nets and we would discourage developers from doing so. “We have already included biodiversity features into new housing developments, such as ‘hedgehog gaps’ at the bottom of new garden fences to allow them to continue to move around easily and will explore other avenues for us to protect and conserve wildlife in Barnsley.” A revised Barnsley Local Biodiversity Action Plan was produced in 2008 by the Barnsley Biodiversity Trust to reflect the UK Biodiversity value of the borough, and it was adopted by Barnsley Council in 2010. It is still the adopted plan but is currently under review. It is anticipated that a revised version of the plan will n BAD NETTING: Janet Mason and Lynn Wood warn of the dangers to our be adopted later this year. local hedgehog populations from netting like that above. PLANNING permission is being sought for three new homes in West Melton. The applicant, a Mr O’Donnell, would like to erect three new properties to the rear of 20-26 Carnley Street. One of the dwellings would be a two-bedroom and there would be two three bedroomed properties. The consultation period runs until April 16 with people able to have their say via Rotherham Council’s website. able for them, providing the option to fit in studying around their work pattern or family commitments. Courses are suitable for anyone wanting to gain English and maths qualifications and attendees will undertake an initial assessment to determine the level on which they should start the course. Andra Ghencea, head of department for English and maths, said: “These courses will provide participants with the opportunity to gain their English and maths qualifications over Easter, preparing them for their next step whether that be career progression, further study, making everyday life a bit easier or helping their child with their homework.” n Call Barnsley College on 216 123, or email: info@barnsley.ac.uk. Largest selection of leather fashion items in South Yorkshire. being forced to dismantle a crewing system introduced at some stations without agreement from the Fire Brigades Union, which means increased costs of £1.4m a year and an unexpected hike in pension costs could account for the rest. Now the service has concluded the only way to make up the cash shortfall from the crewing arrangement is to reduce numbers of firefighters who crew its trucks from five to four, arguing that staffing level is currently in place for around a third of incidents. That has been fiercely criticised by the FBU as unsafe for both the public and firefighters, because of the number of jobs which need to be done immediately as they attend 999 incidents. It is currently accepted nine firefighters are needed to operate safely at a house fire, meaning three fire appliances would need to turn up rather than two if crewing is reduced to four across the board. ably be the starting point for this analysis.” Neil Carbutt, the FBU’s secretary in South Yorkshire, blamed the government for the looming spending crisis, for failing to warn early enough of a looming black hole in pension costs. Now he is urging politicians including councillors, MPs and Sheffield City Region Mayor Dan Jarvis to lobby the government to plug the gap permanently. At present, Whitehall will bear the full cost for 12 months and 90 per cent in the following year, before handing responsibility to fire authorities. Mr Carbutt said the impact of reducing firefighters from five to four on all fire engines would mean three, not two, would have to attend house fire incidents to provide the minimum nine crew members needed to operate in safe conditions, something which would take more time. “Time is crucial. This is serious stuff. “I am devastated by these proposals, they will massively affect firefighter safety,” he said. Deputy chief fire officer Alex Johnson said: “We’d rather not make any changes at all, but have a duty to match our resources to local risk and to manage the service in a financially responsible way. “We face cost pressures of up to £4m and the extent of the savings required is inevitably going to mean changes to the way we provide our 999 service to the public. “We think it is better to reduce the number of firefighters on a fire engine, than it is to slow down our response times by reducing the number of fire engines which are immediately available. “Our fire engines already attend incidents with four firefighters about a third of the time – and many other UK fire services already ride with four as a norm.” Fire and Rescue Authority members will have to decide whether to accept the proposed changes. 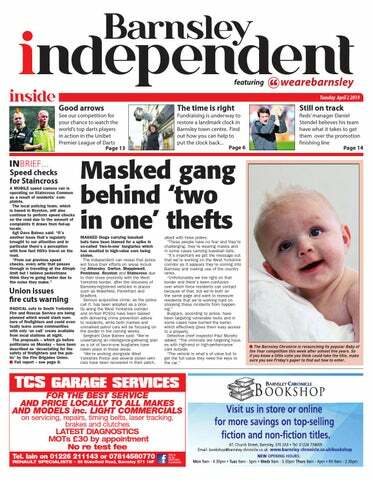 STAFF from the Barnsley Independent took to the streets of the town centre to show off the new paper last week. There was a positive reaction from the general public with people excited about getting the news delivered straight to their doors. Sarah boosts Mayor’s campaign A WORLD champion cyclist and swimmer has been named as Mayor of South Yorkshire Dan Jarvis’s new active travel commissioner. Dame Sarah Storey, 41, announced she will lead the active travel agenda in the Sheffield City Region at an event at Sheffield Hallam University yesterday. She is the most successful female British Paralympian of all time, with 14 gold medals, and has broken 76 World Records in her career. Her role will involve championing active travel and working alongside Mayor Jarvis to create a region in which more people travel on foot, by bike or by public transport. She said: “I’m proud and excited to be the first active travel commissioner for the Sheffield City Region. I believe active travel is a less stressful way of moving about, and helps to create the foundation of a happier workforce and a happier population. “As someone who’s passionate about active travel, and through my policy work with British Cycling, I’ve been so interested in what Chris Boardman is doing with Andy Burnham over the Pennines. It’s brilliant to have the opportunity to work closely with Mayor Jarvis and his team to do something similar here. n BACKING: Dame Sarah Storey. “For me, this is about having another string to my bow, and utilising that profile of elite sport to benefit the wider population. Not everyone is going to be an elite athlete, but we can all enjoy being more active. I’m looking forward to seeing how, together, we can make real changes to the way people travel in the Sheffield City Region.” Mayor Dan Jarvis said: “I’m delighted to name Sarah as our active travel commissioner. To have such an exceptional, inspirational and passionate individual leading our active travel agenda is very exciting. ing fighting to improve travel on buses. George Arthur, secretary of SYFR, said: “We applaud Stagecoach for allowing the elderly to travel free to hospital appointments before 9.30am and to give half price travel on X10 and X17 services before 9.30am. “We are also pleased that South Yorkshire mayor Dan Jarvis has met with us and is looking at a number of issues we raised with him.” The campaigners held a rally outside Barnsley bus station on Monday before travelling to Sheffield for a larger rally outside the station. Changes to bus route STAGECOACH has announced there will be changes to a bus service which serves Barnsley to Sheffield from the end of April. A consultation was held by the travel company back in January this year and as a result, the Service 2 will see some changes. The service will now become the X2, which will offer new connections to Hoyland and the Royal Hallamshire Hospital. The X2 will run Monday to Saturday mornings/daytime and will be a limited stop service between Barnsley and Birdwell and Chapeltown and Sheffield. Service 2 will run on evenings and Sundays and will stop at all stops along the route. Both the 2 and X2 will serve Worsbrough Village, picking up and dropping off at all stops. The X2 will stop outside the Northern General Hospital on Barnsley Road, whilst the service 2 will serve the clock tower stop within the grounds on evenings and Sundays. The new services will begin from April 28. Left to right, from top: Abigail Elizabeth, Kimberley White, Paula Count-Nicholson, Dawn Bamford, Jamie Hallas, Sherrida Williams and Lindsay Needham. EACH week we give away a pass to Playmania to one of Tarn’s cutest kids. This week’s winner is two-yearold George. Isn’t he handsome? Enjoy your time at Playmania! a few pounds, our nurses will discuss a suitable diet plan with you. On the contrary, if your pet is slightly underweight, we will give you some tips to try and get them back in top condition. Dental checks Whether your pet is young or old, their teeth need to be regularly checked as tooth and gum disease is common. Sometimes oral hygiene can be neglected, resulting in health problems, which is why we recommend you bring your pet for a dental check at least once a year. Post Op health check To ensure your pets good health and recovery post op, we can provide a post op checks. Pet nail clipping Foot care for your pet should involve nail clipping where necessary to help maintain a comfortable, pain free nail bed. Please ask for more information. If you would like to know more about our nurse clinics, please don’t hesitate to get in touch. Call a member of our friendly team today on 242 217. We love seeing photos of your pets and you love showing your pets off! Here’s a round-up of this week’s papped pets... Left to right, from top: Noah, Phoebe, Joseph, Sam, Spocky, Basil, Blinky, Daisy, Nelly and Bessie, Quinny, William, Godzilla, Alfie and Snoop. THE world’s leading darts players will return to The FlyDSA Arena for Night 15 on Thursday May 9 as the 2019 Unibet Premier League makes its annual visit to Sheffield for a 13th time. Former champion James Wade will return to the Unibet Premier League in 2019 following confirmation of the ten-player field for the tournament, which also features Raymond van Barneveld for a final season ahead of his retirement. Darts’ widest-reaching tournament will see 17 nights held from FebruaryMay, as players compete for spots in the Play-Offs to battle for the prestigious title. Guests include 2009 champion Wade, who returns to compete for a tenth season in the Premier League, having won the European Championship and World Series of Darts Finals during 2018. Players Championship Finals winner Daryl Gurney, Grand Slam of Darts champion Gerwyn Price and German Darts Masters winner Mensur Suljovic show to life through demonstrations and assisting in the sheep all compete for a second year, having made their Premier League debuts in who were giving birth to their 2018. lambs. The Cannon Hall Facebook page Five-time World Champion Van Barneveld, the 2014 Premier League held a ‘Gogglebox’ style view champion, will play in a 14th succesalong, and over 300 comments sive season as part of his farewell were left praising the farm for year on the circuit ahead of retiretheir work. Joy Muhammad said: “Fantastic ment. Four-time champion Michael van family viewing. You have built up Gerwen will be begin his title defence a wonderful business and are a when the season begins on February lovely family. Farmer Roger and 7, having claimed glory in 2013, Cynthia must be so proud of everything you, as a family, have 2016, 2017 and 2018 and also won achieved. Congratulations to you all.” The show was presented by Countryfile presenter and farmer Adam Henson and Spring Watch Unsprung’s Lindsey Chapman. I know and always puts others before her self. She has six grandchildren and two great grandchildren. She is the best grandma any one could ask for and the best mother I could ask for. She is my world and my rock.” Congratulations to you both ladies. Enjoy your treat! his third World Championship title on Tuesday night. Last year’s runner-up Michael Smith Tuesday’s World Championship finalist – remains in the field following his success at the World Championship, while two-time champion Gary Anderson, former World Champion Rob Cross and 2017 Premier League finalist Peter Wright are also in action. WAB have teamed up with FlyDSA and we’re giving one lucky the reader the opportunity to win a pair of tickets to watch this fantastic event. To win all you have to do is send your name and contact number to competitions@wearebarnsley.com. Alternatively you can enter by post by sending your name and contact number to WAB Darts, 47 Church Street, Barnsley, S70 2AS The closing date is Friday April 12. Good luck! Reds twice lose the lead to courageous Cov BARNSLEY took the lead twice but drew 2-2 at home to Coventry City on Saturday. Alex Mowatt put the hosts ahead early on but Coventry levelled with the first goal conceded by the Reds in seven matches. Cauley Woodrow netted three minutes after the break but City again equalised midway through the second half then had the better chances to get the winner. The result kept Barnsley second, five points clear of thirdplaced Portsmouth who have one game in hand and six ahead of fourth-placed Sunderland who have played three fewer matches. They are seven points behind leaders Luton Town who won at Bristol Rovers. The Reds are now unbeaten in 20 league matches across almost four months while they have not lost in 24 league fixtures at Oakwell. They were the better side for the first half of each half but then faded against a Coventry side, managed by former Barnsley boss Mark Robins, who are hovering just outside the play-offs. Head coach Daniel Stendel said: “We had not conceded in seven games so when we scored early we thought a little bit that we had won the game. “Maybe we didn’t concentrate enough in the box to score the 2-0 goal. That was the biggest thing for me, and we didn’t defend so well. “The draw is OK, but we wanted to win and we are a little bit disappointed. In the first half, we had a lot of chances and played very well but Coventry scored their only chance. “In the second half it was a close game and we gave them a lot of space and some chances because we were trying to win the game but we have a good goalkeeper Adam Davies and we expect he will make saves.” Stendel made two changes from the side that won 1-0 at Walsall the previous week. Ryan Hedges and Adam Davies, who had just returned from international duty with Wales, replaced Mike Bahre and Jack Walton in the starting line-up. Barnsley played 4-4-2 with Mamadou Thiam up front alongside Cauley Woodrow while Hedges was on the left wing and Jacob Brown on the right. ON TARGET: Barnsley celebrate but they were pegged back. Pictures: Keith Turner. McGeehan after Woodrow let the ball run to him in a good position. But the Sky Blues levelled on 65 minutes when Williams saw a clearance blocked and Luke Thomas received the ball on the edge of the box, cut in front the right and fired into the top left corner. Williams almost put Barnsley back in front with what would have been his first career goal but his powerful and swerving 25-yard shot was fumbled away by goalkeeper Burge. Coventry nearly went in front when Amadou Bakayoko’s flickon put Hiwula through on goal but he hesitated and, under pressure from Ethan Pinnock, his eventual shot was comfortably saved by Davies diving low to his right. Liam Lindsay’s terribly underhit backpass then put Bakayoko clean through and he went round Davies but overhit the ball which went out of play. McGeehan’s shot from 15 yards with seven minutes to play was easily caught by Burge. At the other end, Davies sprang to his left to brilliantly save a header from Dom Hyam who beat the offside trap and was unmarked seven yards out then the goalkeeper tackled Charlie Wakefield who tried to reach the rebound. Davies then made another fine save in injury-time to tip over Bakayoko’s header. Barnsley (4-4-2): Davies; Cavare, Pinnock, Lindsay, B Williams; Brown (Green 81mins), Mowatt, McGeehan, Thiam (Adeboyejo 88), Hedges (Bahre 77); Woodrow. Unused: Walton, Jackson, Styles, J Williams. Coventry (4-4-2): Burge; Sterling, Willis, Hyam, Mason (Brown 78mins); Thomas (Wakefield 86), Bayliss, Kelly, Hiwula; Enobakhare, Bakayoko. Unused: Addai, Grimmer, Davies, Meyler, Brown, Wakefield, Shipley. Unit 13, Albion Road, Carlton Ind. Estate, Carlton, Barnsley. Do you want your business to be seen? Gas central heating, uPVC. Part furnished. Off-road parking. Close to all local amenities. From £100 per week. Limited garden maintenance. Hours available. Over 20 years experience. Pot wash required Working in our busy Bistro, you must be efficient and hard working with a can do attitude. Must be available to work weekends and bank holidays. Full & Part time position available. Applications to office@cannonhallgardencentre.com or call 01226 790785. Every 6 seconds someone contacts Samaritans. Apply online at www.volunteer.samaritans.org/volunteer Full training will be given. No internet? Contact 01226 244 447 An enhanced DBS check will be required. General Labourer required for outdoor physical, sometimes heavy, work. Own transport essential, Location approx 7 miles North of Barnsley. Nail Trimming, Corn Removal, Ingrown Toenails, Verruca Treatment, Calluses Reduced. Foot Care for Diabetics. 731 168 Same day denture repairs Qualified C.D.T.A. Visit us in store or online for more savings on top-selling fiction and non-fiction titles. R Nicholson, 1 Laithes Lane, Athersley. 19 years in the trade • Friendly service Extra sockets from £45, fuse boxes, rewires, replacement fittings, CCTV. Plumbers S. P. PLUMBING SERVICES Bathroom suites fitted inc. tiling, showers, washing machines, radiators, kitchen sinks. Bathroom Suites • LPG Boilers FREE QUOTES. GAS SAFE REGISTERED. Local Electrician Lights, sockets, fuse boards etc. Inspecting and testing, Part P registered, work guaranteed. • Part P. Approved (ELECSA) • All types of electrical work undertaken. • Testing and inspection. your requirements. Watch your CCTV on all televisions. Covering all aspects of roofing, from little repairs to full re-roofs/chimney specialists. Wifi and Telephone Solutions Network Exts, Wifi Hotspots, Telephone problems, New Socket etc. 01226 734666 Do you need help installing/setting up TV? Internet problems? Wifi issues? Computer problems? Phone sockets moved or installed. Aerials installed/moved. Installation of CCTV or upgrades. • Sockets • Lighting • Security Lighting etc. No job too big or small Part P.
Fast, efficient, low cost repairs to all makes of washers, dryers, cookers, dishwashers and vacuum cleaners. 2 ton, 3 ton, 4 ton, 6 ton, 8 ton, 10 ton and other sizes available. RUBBISH REMOVED Anything and everything. TV Aerial Compact, storm proof. For best prices in Barnsley. Waste Carriers Licence. Two ton skips available. 1 ton Rhino Bags. CConvert onvert yyour our old cconservatory onservatory in into to a sta state te of the ar artt oor orangery. angery.